TBWMYFO v.16 :: The Angie, Kristy & Dyan [Charlie’s Angels Remix] Edition! Graduation. People do it. It’s what some people do when they complete something major… fifth grade… high school… or NURSING SCHOOL. And what do friends do when they graduate from nursing school? If the are the most cooliest of coolio they come down to the FunCenter for pictographs! Angie, Kristy & Dyan knew that, and I was the one lucky enough to schedule their appointment! They knew how things went. They were so good at being pictographed, that they could tear it up not only in casual clothes, but nurse uniforms too. This may not seem all that hard to some of you, but it is. 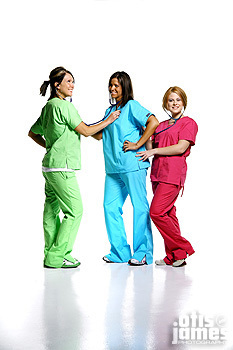 I am a huge fan of the scrubs… I would wear them 4 to 6 times a week if it was socially acceptable. For some reason though, people look at you different when you are wearing a surgeon’s top in a photography studio (apparently it’s bad enough I have a Star Wars poster behind my desk). Now that I think about it, it would be kind of funny to see some customers come in for a reorder. Old Man Otis would say “Ben… er… Milo will help you downstairs.” The happy customers would come down and be horrifically creeped out as I came toward them in scrubs, square glasses, and a scalpalish looking pen. Okay, that seemed off subject, but it just goes to prove how spectacular Angie, Kristy & Dyan were — they could rock the scrubs — and then some. Plus, you should have seen some of their stellar Charlie’s Angels posing… I only walked through it and it was crrrrrrrrrazy. So let’s slice off a big piece of blogalicious thanks to these three lovely ladies, and… hmm… how does it go again? Oh yes — Enjoy! Love the pics girls and CONGRATS on graduating!! The worst is yet to come…passing boards! Best Wishes! Previous Previous post: TBWMYFO v.15 :: Family Edwards, Rockin’ The House Edition, Yo! Next Next post: TBWMYFO v.17 :: The Family Erck Edition!